As a first time attendee to the Hatboro Dog Club, Devon Dog Show Association, and Montgomery County Kennel Club dog shows, I was extremely impressed by the obvious commitment that each show committee gives to running these celebrated and prestigious events. 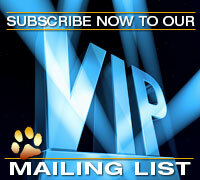 All breed and terrier enthusiasts alike gathered from all over the world to be a part of these unique events. Their energy and enthusiasm was felt throughout the show each day. The Hatboro Dog Club held their show on Thursday and Friday, October 3rd and 4th in Wrightstown, Pennsylvania. 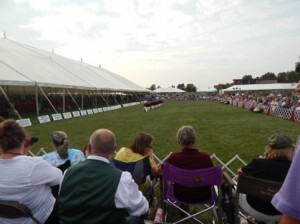 This club hosts a multitude of specialties and supported entries, for many terrier breeds, but also for Greyhounds, Salukis, and German Shepherd Dogs. The judging panel included many breed and group specialists. There were notable entries of all terrier breeds, but topping the show were 83 Miniature Schnauzers on Thursday and 86 Kerry Blue Terriers on Friday. 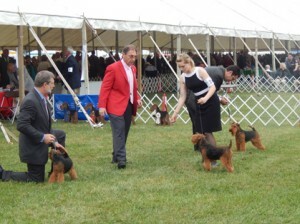 Many of the terrier breeds took an entire day to judge, making the Terrier Group to be the last group judged. The crowd gathered each day to watch the Terrier Group and Best in Show judging. On Thursday, Mrs. Keke Kahn awarded GCh. Afterall Painting The Sky Best in Show. Sky is a Wire Fox Terrier handled by Gabriel Rangel for owners Victor Malzoni Jr., Torie Steele, Diane Ryan and S and M Olund. Her Reserve Best in Show was the Portuguese Water Dog, GCh. Claircreek Impression de Matisse. Matisse is handled by Michael Scott for owners Milan Lint, Peggy Helming and Donna Gottdenker. 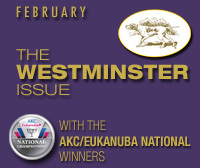 On Friday, Mr. Desmond Murphy awarded the aforementioned Wire Fox Terrier Best in Show and the Afghan Hound, GCh. Tells Matrix Reloaded Reserve Best in Show. Matrix is handled by Chris Manelopoulos for owner Missy Ann Galloway. Exhibitors and spectators then made the drive to Ludwigs Corner Horse Show Grounds for the Devon Dog Show Association on Saturday, October 5th. This was the largest of the All Breed shows held this weekend, with over 2000 dogs entered. Mr. Clay Coady had the honor of judging this esteemed event’s Best in Show. He awarded top honors to GCh. Shaireab’s Bayleigh Maid of Honor, a Welsh Terrier, handled by Luiz Abreu for owners Sharon Abmeyer, Keith Bailey, T Lee and X Xie. His Reserve Best in Show was the Irish Water Spaniel, GCh. Whistlestop’s Riley On Fire, who is handled by Richard Krieger for owners Tom and Bethany Urban and Gregory Siner. The illustrious Montgomery County Kennel Club was the finale event, taking place on Sunday. Crowds surrounded each breed ring, with some rings attracting crowds of five people deep. Many of the breed judging was a day long event, beginning in the morning, breaking for lunch, and finishing in the afternoon – with some breeds, such as Wire Fox Terriers finishing only a few minutes before Best in Show judging which began at 4:00 pm. There was a mournful announcement before Best in Show judging that Mr. Walter Goodman, Skye Terrier icon and President Emeritus of the Montgomery County Kennel Club, had passed away that afternoon. There was a moment of silence in his memory, followed by a hearty round of applause for Mr. Goodman. Mrs. Roberta Campbell was center stage for the judging of Best in Show. Her procedure for each exhibit was a down and back, and then a go around to the center of the ring to free stack. This was quite dramatic and also allowed the entirety of the crowd to see each Best of Breed winner well. She awarded the Wire Fox Terrier, GCh Afterall Painting The Sky, Best in Show, following with the Russell Terrier, GCh. Goldsands Columbus, the Miniature Schnauzer, GCh. Allaruth Just Kidding V Sole Baye, and the Lakeland Terrier GCh. Larkspur Acadia Save Me A Spot. Posted by chesliepickett on Oct 9 2013. Filed under Featured, iReports. You can follow any responses to this entry through the RSS 2.0. Both comments and pings are currently closed.